Increasingly concerned about the close relationship between the food they eat and their health, consumers today are demanding tasty food that is also nutritious and healthy (safety and wholesomeness). Canada is recognized worldwide as a country that produces superior-quality food that can be consumed in total confidence. The regulations applied in Canada and Quebec, combined with the work of all players in the chain, make Canada’s food reserve one of the top ranked and healthiest in the world. Quebec beef and veal farmers are particularly eager to respond to consumer concerns. Everyone involved in the agri-food chain works conscientiously to produce foods of high nutritional value and free of harmful substances. Producers, veterinarians, livestock feed manufacturers, companies specializing in animal health, the government and even consumers all have a role to play. Quebec beef and veal producers are particularly anxious to respond appropriately to consumers’ concerns. Thus quality programs have been developed and implemented on the farms. All meat sold in Canada to retailers, restaurants and institutions has been inspected in advance. Two levels of government inspection are applied: federal and provincial. The role of these inspection services is to supervise cattle production to ensure that health and safety guidelines are observed. The inspection services for provincially-registered establishments are the responsibility of the Ministry of Agriculture or the Ministry of Health, depending on each province’s policies. The provincial guidelines vary according to the standards established by each province. Provincially-inspected meat products can only be distributed within the province of inspection. For more information, visit the MAPAQ‘s website. To better meet consumers’ expectations regarding food safety, PBQ has implemented programs based on the principles of Hazard Analysis and Critical Control Point (HACCP). These programs are recognized internationally and are part of the Canadian On-Farm Food Safety Program (COFFSP). A Hazard Analysis and Critical Control Point system is one approach to management of chemical, physical and biological risks at every link of the food production chain. During food production, each critical point is identified and managed to control the proliferation and/or presence of microorganisms that could present a risk to consumers. The HACCP method facilitates vigilance by identifying steps in situations where a contamination hazard exists. The use of good on-farm agricultural practices, combined with consistency in monitoring operations and record-keeping, ensure food quality and safety as well as production efficiency. Buyers’ concerns are varied but focus, in particular on food safety, animal health and welfare, and the environment . Over the years, the cattle industry and the market have adopted auditing programs to reassure consumers that producers convert talk into action. The objective of this approach is to ensure greater transparency and restore confidence in consumer choices. Thus, in the cow-calf and fed cattle sector, the Verified Beef Production Plus (VBP+) is in force. Nearly 60% of Quebec’s fed cattle production volume is produced in accordance with this program’s requirements. Today, customer expectations regarding food safety, both in Canada and internationally, compel food merchants to insist that their suppliers establish and follow an exhaustive food safety system. As producers, we must prove to current and potential customers that our products meet their increasingly strict requirements. The Verified Veal Program is designed to afford producers a means of responding to consumers who ask for proof of food safety. It provides our customers with the assurance that the veal produced in Canada, both milk-fed and grain-fed, is first quality. Our approach addresses food safety through a program based on HACCP. All producers may participate provided that they comply with all the program’s requirements. Currently, 38 milk-fed veal producers are responsible for 33% of the production volume that complies with the Verified Veal Program. The Quebec Certified Grain-Fed Veal Program defines the origin and quality requirements and the minimum characteristics Quebec grain-fed veal producers must satisfy to achieve certification. This certification program contains all the requirements of the Verified Veal Program. Thus, by obtaining “Quebec Certified Grain-Fed Veal” (VGQC) certification, the farm is automatically compliant with the Verified Veal Program. The program is mandatory for all Quebec grain-fed veal producers. “Quebec Certified Grain-Fed Veal” is a certification mark that has been registered by PBQ in the Canadian Certification Marks Registry since 2003. 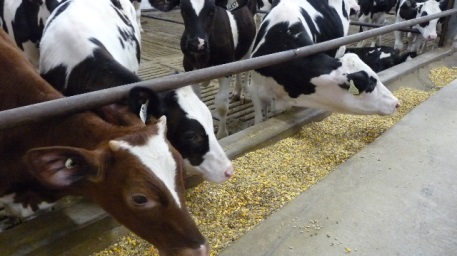 Continuous traceability assures the origin and rigorous monitoring of Quebec grain-fed veal. The fulfillment of all the steps leading to certification allows the use of the “Quebec Certified Grain-Fed Veal” name and logo.